Oscar Celestin, “Kid Shots” Madison (cnts. ), William Ridgley (tbn. ), Willard Thoumy (clt. & alto sax. ), Unknown (tnr. sax. ), Manuel Manetta (pno. ), John Marrero (bjo. ), Simon Marrero (sbs. ), Abby Foster (dms. & swannee whistle). Oscar Celestin (cnt. ), August Rousseau (tbn. ), Paul Barnes (clt. & alto sax. ), Earl Pierson (tnr. sax. ), Jeanette Salvant (pno. ), John Marrero (bjo. ), Abby Foster (dms. ), Charles Gills (voc.). 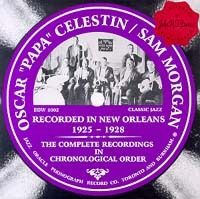 As April 13, 1926 session except add Ricard Alexis (cnt. ), Sid Carriere (sop. & tnr. sax. ), Simon Marrero (sbs. ); Abby Foster, Ferdinand Joseph (voc.). Oscar Celestin, Ricard Alexis or George McCullum (cnts. ), August Rousseau or William Matthews (tbn. ), Clarence Hall (clt. & alto sax. ), Oliver Alcorn (clt. & tnr. sax. ), Jeanette Salvant (pno. ), John Marrero (bjo. ), Simon Marrero (sbs. ), Josiah Frazier (dms.). Oscar Celestin, Guy Kelly (cnts. ), Ernest Kelly (tbn. ), Earl Pierson (clt. & alto sax. ), Sid Carriere (clt. & tnr. sax. ), Jeanette Salvant (pno. ), Narvin Kimball (bjo. ), Simon Marrero (sbs. ), Abby Foster (dms.). Walter Decou (pno.) and Roy Evans (dms.) replace Baptiste and Williams.